Let me tell you a tale. A tale of the depth of emotion that art can evoke. A tale that will make you pause. A tale I hope will demonstrate why art history is valuable. As trite as it sounds, I have a favorite artist, Mark Rothko. And, speaking of trite, I was looking at a You Tube compilation of his work today. At the end were comments, lots of comments. I started to read a few but got hung up on the first one. A comment so glaring for demonstrating the author’s complete lack of understanding of the history behind the art that it catapulted me here to write. Mark Rothko (1903-1970) was an intelligent and philosophically inclined man who won a scholarship to Yale but left New Haven after two years to join the Manhattan art scene (he was later awarded a degree from Yale). There he began his art education with classes in representational drawing and painting. Ultimately however, he became known for abstract painting and would be placed in the group of artists working in the 1950’s called the Abstract Expressionists. Rothko filled huge canvases with large blocks of vibrant colors. I paint very large pictures because I want to create a state of intimacy. A large picture is an immediate transaction. It takes you into it. His technique was novel and refined; he painstakingly applied series of layers of thin washes of colors that added up to creating a luminescence and a remarkable shimmering effect. Rothko disliked giving up these masterpieces of scale and light and color. It’s a risky business to send a picture out into the world. How often it must be impaired by the eyes of the unfeeling and the cruelty of the impotent who could extend their affliction universally! I am not an abstractionist. … I am not interested in the relationship of colour or form or anything else. … I’m interested only in expressing basic human emotions — tragedy, ecstasy, doom and so on — and the fact that a lot of people break down and cry when confronted with my pictures show that I communicate those basic human emotions. … The people who weep before my pictures are having the same religious experience I had when I painted them. And if you, as you say, are moved only by their color relationships, then you miss the point! In 1958 Rothko was offered an enormous (for the day) retaining fee to produce a set of murals to hang on the walls of the new Four Seasons restaurant in the building designed by architect Mies van de Rohe and owned by the Seagram’s distilling company. He then rented an old gymnasium and erected scaffolding to model the space at the Four Seasons and began working. In a short time there were dozens of canvases of red, maroon, black, brown and flaming orange. From these he planned to choose the best nine to completely cover the walls all around the main dining. They would thus become more like murals, than individual paintings. Rothko’s works became sought after, his income soared to 60,000 in 1959 and yet, he mistrusted the wealth that bought his work. 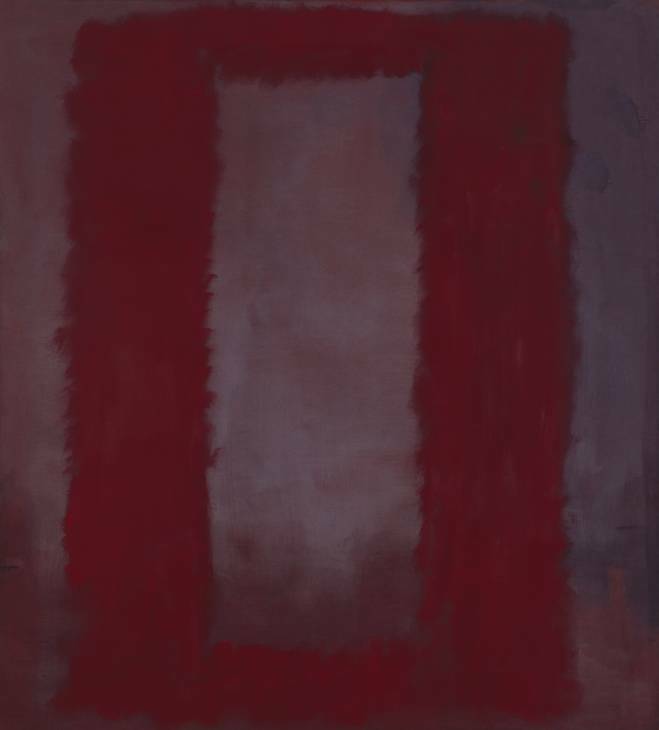 Simon Schama explained that Rothko’s fear was having the paintings become “overmantels” or expensive wallpaper for the rich. Perhaps it was this fear that motivated Rothko to go with his wife to the newly completed Four Seasons restaurant one night in the summer of 1959. There they dined amongst the glittering decor, clinking glasses and stylish Manhattanites. There it suddenly be came clear to Rothko that his murals were not meant to hang on those rarefied walls. He felt, likely rightly so, that the diners would not understand his work let alone have the sort of emotional experience he intended for a viewer to have. He turned down the money – approximately $2 million. Anyone who would eat that kind of food for that kind of money will never look at a painting of mine. Then followed years of struggle with alcohol and creation of paintings of an progressively dark palette. These somber paintings seem to represent a final step down into a darkening of spirit. His health failed, his marriage failed and he continued to drink and smoke. He became increasingly depressed. On February 25th, 1970 Mark Rothko was found dead in his studio, his wrists slit. Hours later on the very same day, a shipment of nine Seagram murals arrived at the Tate Gallery in London to be hung in a room alone according to strict specifications. 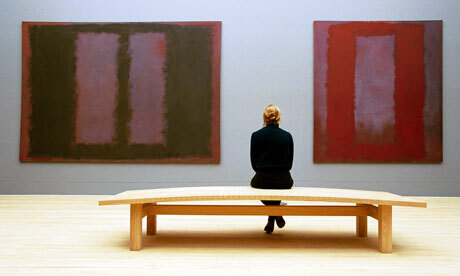 Jonathon Jones wrote in a recent blog post for the Guardian that “Rothko was fascinated by the idea of shaping a room with art, using abstract painting as a type of architecture”. He meant to create a physical space where his canvases could work w ith the surrounding architecture to move viewers to meditate. He meant to induce a religious experience. Upon his death he had created just this. For dear reader, now that you have heard this tale, you can see that art history is powerful. That an understanding of the history of a work of art can create a heightened appreciation of it. To the uneducated You Tube viewer, Rothko’s paintings may look easy (they are not – remember the groundbreaking layering of pigment he developed and the precision with which he displayed them). To the uninformed viewer they may appear an attempt to generate exorbitant sums of money (they were not– remember his mistrust of wealth and that his constant desire to have the viewer emotionally connected led him to turn down $2 million). So, the moral of this story might be that one should ask about art before you judge. And then with your knowledge, enjoy. This is a powerful tale and by telling it to your children over dinner and showing them some of Rothko’s art (try the youtube compilation) you will begin to hook them on the world of art. You may worry about telling them about Rothko’s suicide but then, you could view this part of the tale as a “teachable moment”. It presents to you an open door to start further dinner discussions about depression, addiction and suicide. These are all parts of the world experience that we hope our children avoid. You have a powerful ability to influence their choices if you are willing to discuss these difficult topics. It has been sown that children whose parents frequently talk with them and clearly convey their expectations regarding drug and alcohol use are much less likely to end up abusing substances. Feel your power and start talking. To help here are a few resources.